I love breakfast foods and have spend a lot of money on Granola, so the revelation of baking it myself has been a great one. 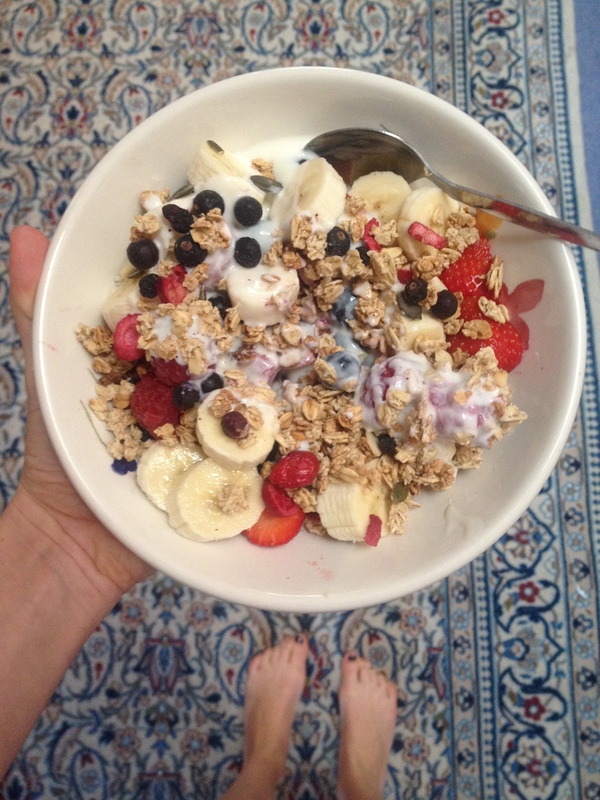 I mentioned about granola making in my muesli post but I thought i’d give you one of my favourite granola recipes. Not only can you control the cost of your granola habit, but you can know exactly what you’re putting into your body! This is one of my favourites but I also just love this recipe without any nut butter. Melt the coconut oil, almond butter and the honey or syrup on a low heat in a pan. Add all your dried ingredients into a bowl, bar your dried fruit if you’re using it. Pour over the liquid mixture and mix it all together. Line a baking tray with grease-proof paper and pre-heat your oven to 350. Pour your mixture onto the tray, sprinkling cinnamon over the top if desired. Put your baking tray into the oven for 10 minutes stirring halfway. Get out the oven and let it cool. Then stir in your dried fruit if your using it or cacao nibs if your feeling like an extra treat! I really like this granola even without the almond butter. I throw in some pecans and cranberries ~ it tastes incredible with almond or coconut milk. Its so good to know exactly what’s in your granola as many store bought varieties are filled with sugar and vegetable oil! Play around with the recipe and let me know what different combinations you come up with and most importantly how they taste!